Tooth whitening can help you achieve a beautifully white smile by bleaching your teeth and removing any deep stains. 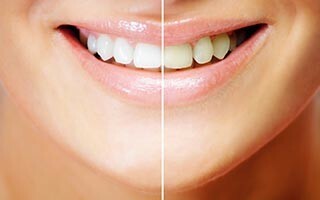 Tooth whitening can be a highly effective way of lightening the natural colour of your teeth without removing any of the tooth surface. It is safe and effective when provided by a dentist. This is an hour long appointment during which Pola Office gel will be applied to the teeth followed by a 15 minute session under a UV curing light. The process of applying the gel followed by 15 mins under the curing light will be repeated three times meaning total treatment time is 45 minutes. Pola Day or Night gel is applied to custom made trays that you wear either at night or during the day, whichever suits you best. Everyone is different; and just as our hair and skin colour vary, so do our teeth. Very few people have brilliant white teeth, and our teeth can also become more discoloured as we get older. Your teeth can also be stained on the surface through food and drinks, such as tea, coffee or red wine. Smoking can also stain teeth. What does in-chair tooth whitening involve? This is an hour long appointment during which Pola Office will be applied to the teeth followed by a 15 minute session under a UV curing light. This process will be repeated three times. It is important to follow up this treatment with the whiten at home trays. What does tooth whitening at home involve? We will take a simple impression of your teeth which will be used to fabricate trays for your home kit which will be delivered 2 weeks after your appointment. These will be used with a home whitening kit consisting of 10 tubes of whitening gel. The gel is applied to the custom made trays that you wear when you want to; at night or any time during the day. To maximise results we can also provide you with further whitening material at a lower additional cost. Our team of expert practitioners will recommend the exact product to suit your teeth and lifestyle. How long does it take when using the whiten at home trays? Most courses of tooth whitening involve 10 to 14 sessions, all carried out at home. Sometimes results may take longer to achieve but your dentist will guide you through the whole process from start to finish until you achieve your perfect white smile. Your dentist will provide you with a maintenance plan, once your treatment is completed. This usually involves one session of home bleaching every three months in order to keep your teeth at that whiter shade. Tooth whitening is a safe procedure when provided by a dentist. We use only approved and regulated materials that have been designed for the dental profession. Some people might find that their teeth become sensitive to cold, during or after the treatment. This can be managed by your dentist and these symptoms are usually temporary and disappear within a few days of the treatment finishing.